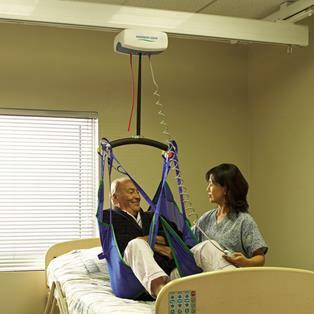 Delivering innovation, reliability, along with superior comfort and safety, the C-450 addresses many of the issues that make patient transfer complex or difficult. The C-450 has been designed with a full set of standard features that can be safely and easily operated by a single caregiver. Built for a quiet operation, the C-450 provides a smooth and effortless transfer that will safely enhance the working conditions of patients/residents and caregivers. With its 450 lbs. weight capacity, this lift will meet the needs of even the most demanding clinical environments. Encompassing waterproof pneumatic controls that are complimented by on-board controls, a digital display (LCD), auto shut-off, and numerous safety features including emergency power lowering, the C-450's innovative features explain why the C-450 is among the most advanced ceiling lifts available. The C-450 is available with manual or power traversing.